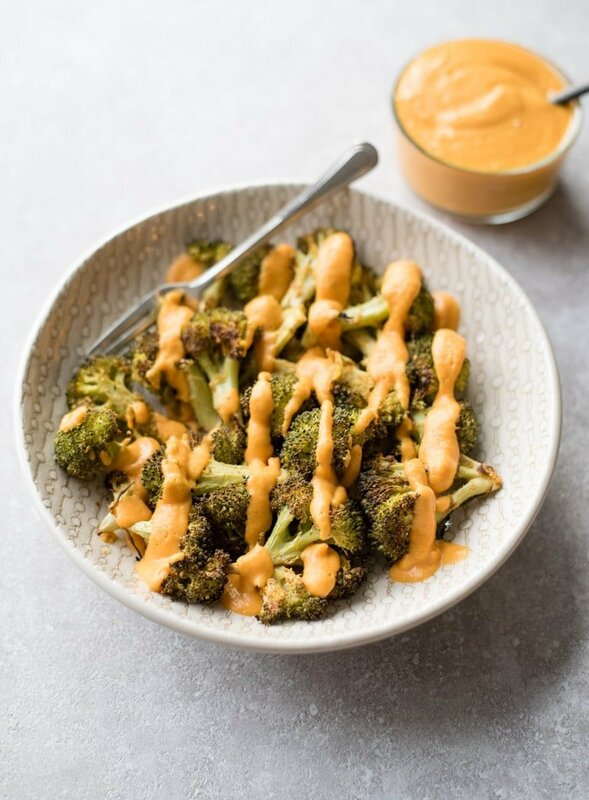 I’ve been making this crispy, cheesy roasted broccoli a lot lately to snack on and the last time I made I got to thinking…what if I put cheese sauce on cheesy roasted broccoli? It sounded a pretty good idea to me. 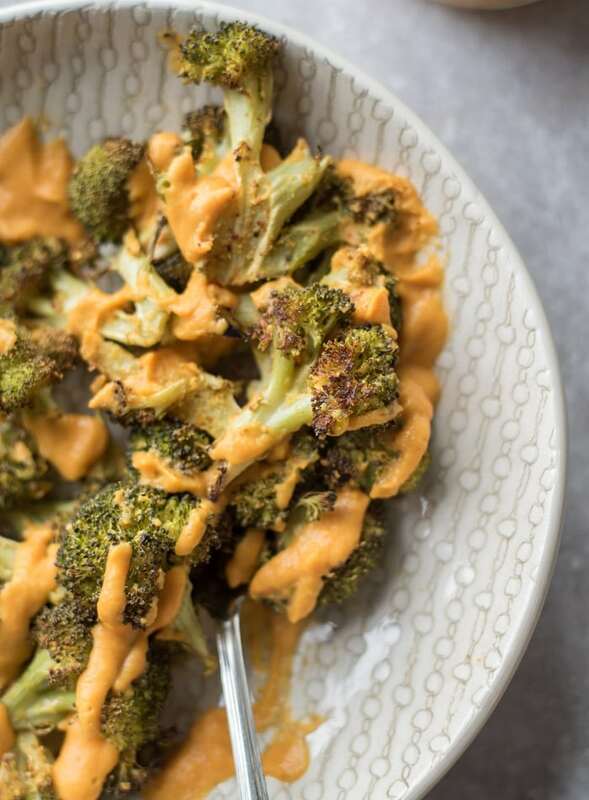 Turns out I was right and this crispy cheesy roasted brocoli served with healthy, oil-free vegan cheese sauce not only hits all the spots but it tastes amazing too! Spread the broccoli on the pan evenly, in one layer. Make sure the broccoli is dry for best results. Toss thoroughly with oil and spices so each piece is coated. Use some olive, coconut or avocado oil for roasting. That’s about it. I usually let mine roast for about 35 minutes or more so they’re nice and crispy and browned. Start keeping an eye on them after 20 minutes to ensure they don’t burn. There are a ton of recipes available for vegan cheese sauce, so this is nothing new. There are a few different ways you can make but I always use nutritional yeast for it’s flavour, colour and nutritional benefits. I’ve made it with cashews, potato and carrot, zucchini, sweet potato and a combination of those ingredients. I’m not a huge fan of how it comes out with sweet potato though. It tastes good but it has a hint of sweetness that doesn’t really go with a cheesy flavour. I’d recommend sticking to yukon gold or any other yellow-fleshed potatoes for this one. Aside from the nooch, you’ll be needing potatoes, carrots and a couple spices. Potatoes provide the creamy, starchy base and carrot provides added volume and colour. It’s really easy to make. All you need to do is boil the potato and carrot until soft, then blend them with the rest of the ingredients. A lot of the vegan cheese sauce recipes out there call for oil but I decided to leave it out and just use water and almond milk. cheese sauce you’re gong to want to put on just about everything. 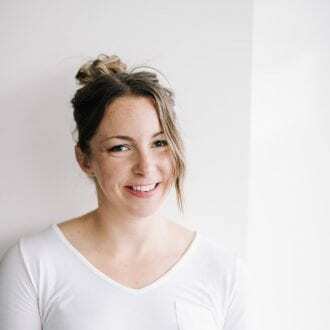 Of course you can make these two recipes independently and use them however you like but they do go pretty great together. 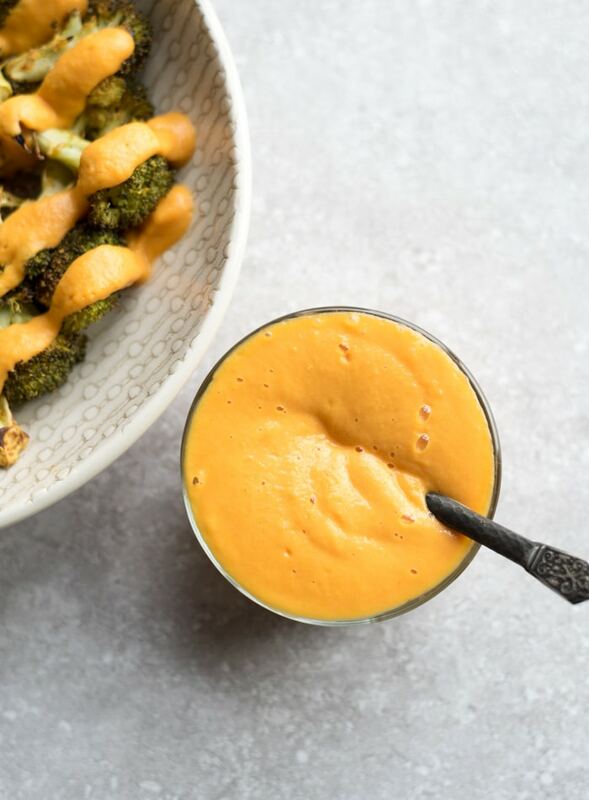 Any leftover extra cheese sauce can be used to make mac and cheese, for dipping tortilla chips, drizzling over vegan pizza, as a dip for baked fries…or anywhere else you’d use a delicious, cheesy sauce. I’m even thinking apple slices…would that be weird? 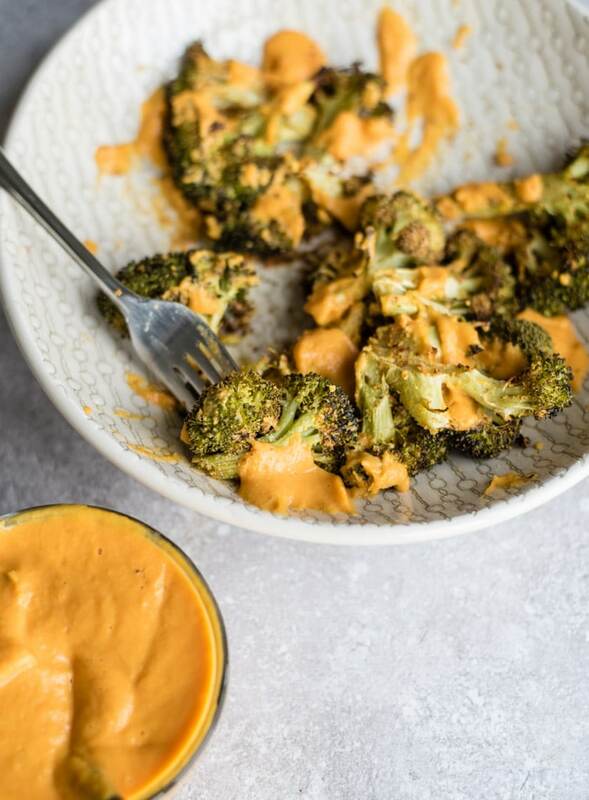 Either way you can go ahead and dip away because this cheese sauce is super healthy! 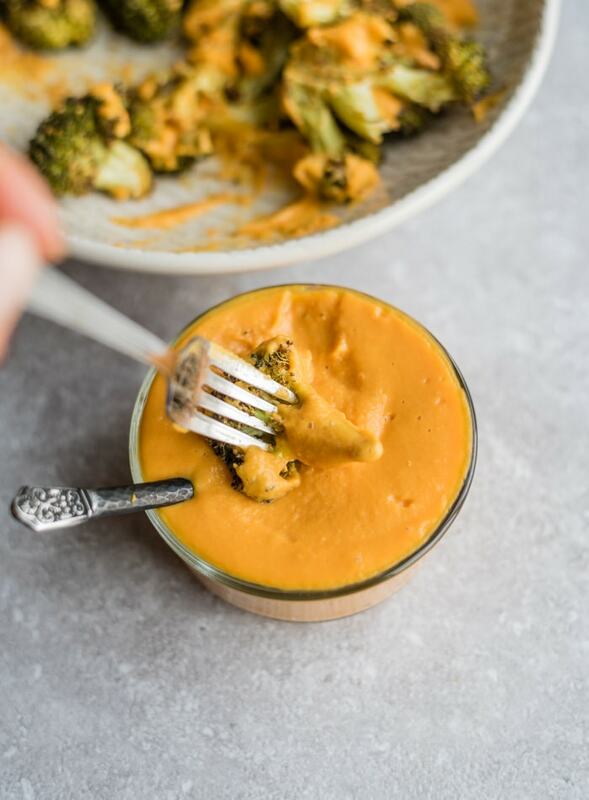 No oil, no dairy…just veggies and nutritional yeast, so not only will you be enjoying a delicious, cheesy sauce, you’ll be sneaking in tons of nutrition at the same time. WIN. As for the broccoli, I like making a double or triple batch with my food prep for snacks and throwing in macro bowls all week. 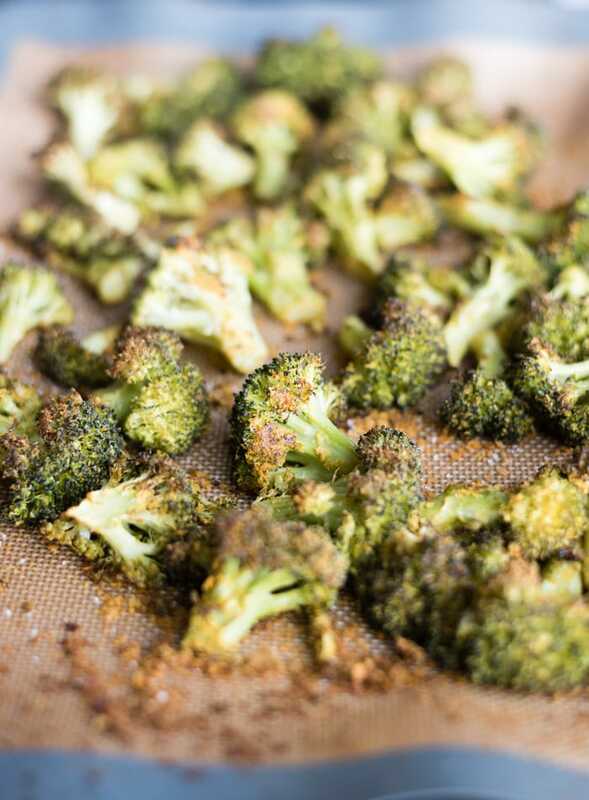 It’s salty, cheesy, crispy, tender and one of my fave ways to eat broccoli. Add the broccoli florets, nutritional yeast, sea salt, black pepper and oil to a bowl and mix well. Spread evenly in one layer on a parchment paper or silicone mat lined baking sheet. Roast for 20-35 minutes until tender and browned. I know that’s a long time window but it’s pretty flexible, I like it really well done so I usually let it go close to 40 minutes. Take a look after 20, give it a flip then keep checking it every 5-10 minutes. Boil the diced carrot and potato in a pot until very soft. Drain then add to a blender with the rest of the ingredients. Blend until smooth and creamy, adding a bit more water if needed to reach desired thickness. Spoon over the finished broccoli and enjoy! It can also be used over fries, as a dip for veggies or chips, on pizza, for mac and cheese and just about anything else you can think of. Extra cheese sauce can be stored in the fridge for up to 5 days. Cheese sauce recipe adapted from Veggie on a Penny. This looks great! 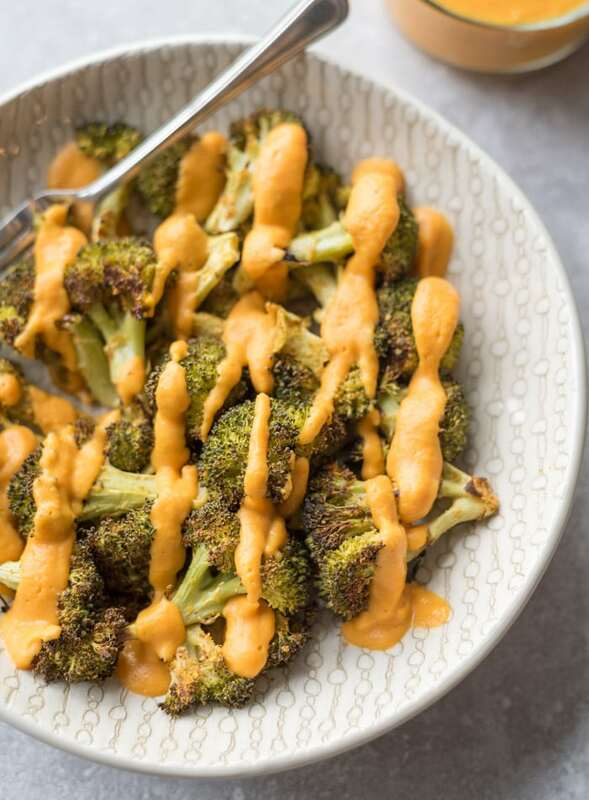 I love broccoli and the sauce looks yummy! Just looking at these beautiful food photos in this blog has me thinking about going back to being a part-time vegetarian again.